As I’m sure many reviews will point out, Carrier of Weight is aptly named, as this is an album of substantial heaviness, both in the sense of sheer heaviosity and weighty atmosphere. Either way, it crushes. With only three tracks, but a total playing time of 68 minutes, Carrier of Weight is a monster of atmospheric heaviness. This is a massive listen, for massive listeners of massive music. Everything about this album is huge, from the riffs that seem to go on forever, to the endless depths of the introspective lighter sections, to the rich, breathing production, to even the album artwork. I like the fact that Carrier of Weight offers the listener a complete package, and everything seems to have been thoughtfully considered and well-realised. The songs are long, but heavily involving. It’s easy to get lost in this kind of thing. Repetitive riffs and hypnotic groove…Carrier of Weight is captivating and easily holds the listener’s attention for its considerable run time. The music is striking and affecting. This album contains tsunamis of atmosphere and emotive delivery that Eremit seem to be easily capable of unleashing, either in thick distorted waves, or understated, nuanced, and textured softness. The vocals consist of soul-swallowing growls and piercing screams, and both are performed very well. They accompany the colossal, apocalyptic music perfectly. Eremit seem to chisel their music from the very bedrock of mountains. 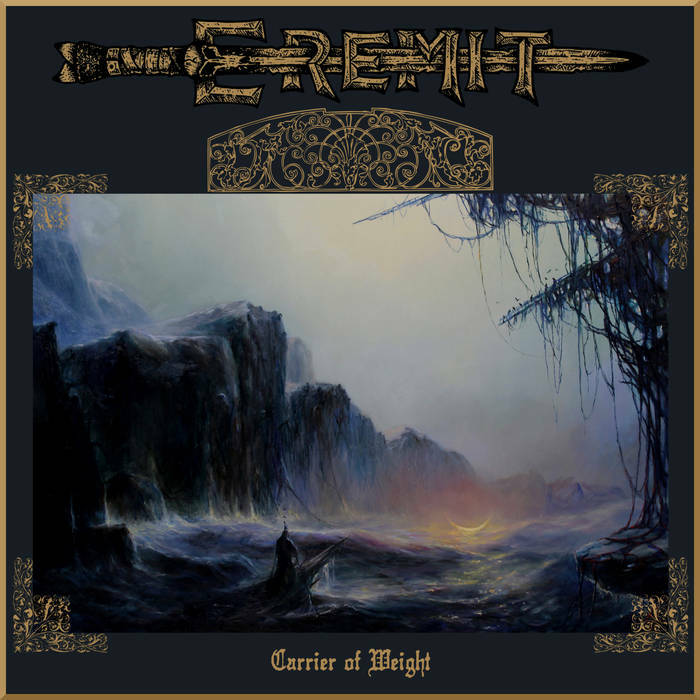 Although a variety of paces are used, this is mainly an album that operates at slow, glacial speeds, with monolithic grace and unhurried intensity; there’s a deep grandeur to this kind of extreme doom, and Eremit are a band that know their art supremely well. For a debut album to master doom and sludge of this standard is jaw-dropping. The very first time I listened to this album the thought struck me; am I listening to one of the best doom albums of 2019, already? Only time will tell, but prime sludgy doom like this doesn’t come along very often. This entry was posted in Doom and tagged Atmospheric Doom, Atmospheric Sludge, Doom, Eremit, Metal, Sludge. Bookmark the permalink.